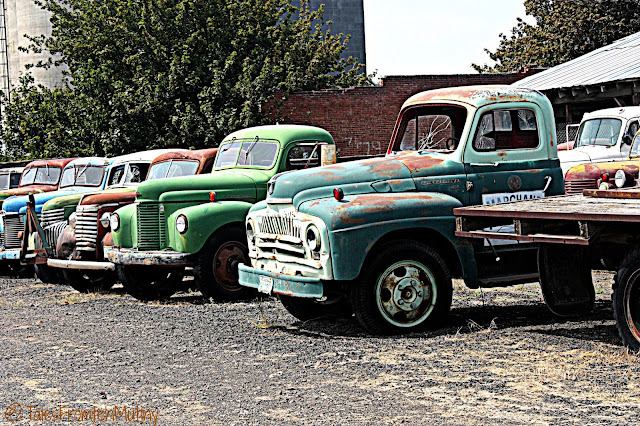 I have to admit…our travels through Eastern Washington state were on the less-than-impressive side. I don’t mean to offend anyone who lives in that area or who thinks it’s the bees knees but man was it hot, dry and dusty. If your impression of Washington is lush mountainsides, foggy coasts and the grey, dizzily days you’ve come to identify with the name Seattle then just drive I90 east of Moses Lake toward Spokane and you’ll wonder if you’ll ever see water again. Okay, so it was August and, as we all know, there’s been a bit of a drought on the west coast these past few years so maybe it’s not always as dry and hot as it was when we passed through the area. But still. Call us spoiled travelers or picky tourists but Eastern Washington is forever off the list of “potential places to settle down”. It ranks right up there with the Dust Bowl area of Oklahoma and Bullhead City, Arizona as too dry, too hot and too flat. Regardless, we were on our way to Seattle to visit our niece, Tina, and nephew, Eddie, and were therefore doomed to travel through the dried up farmlands (how do they even water their crops??) and along the Great Northern Railway route, which made for an interesting stop as you’ll read in a minute. We didn’t know any of these minor details (the heat, dust or trains) when we booked a spot for two nights at Four Seasons Campground and Resort on Sprague Lake. Go ahead and click that link and check out the photos, I’ll wait. Pretty nice, right? And apparently it’s the number one place to go trout fishing in all of Washington. 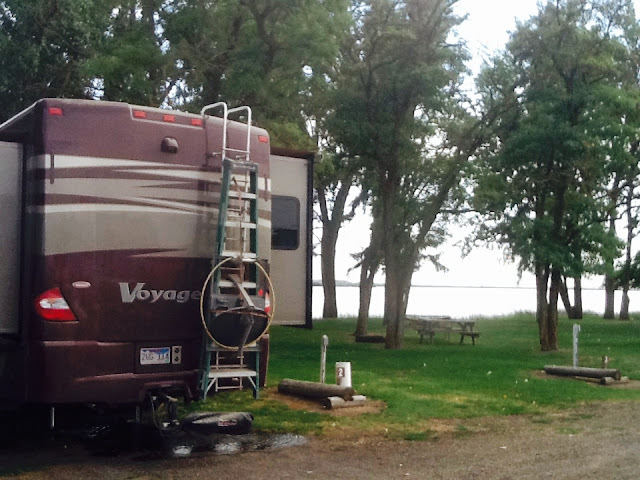 Did you notice that all of the RV sites face the lake, there’s bird watching, float planes, fishing, grass and beautiful sunsets? Clark was still in his angler mode after killin’ the kokanee population in Clark Fork so having another spot to fish was a big part of the attraction. We got off the freeway at the town of Sprague in search of the RV park. To say it’s seen better days is a bit of an understatement. There would be no grocery shopping, dining out or coffee shops. There was however, this cool auto repair shop which I’m pretty sure closed in the 50’s along with almost every other store in town. I can’t remember if I bothered to read to reviews on this campground but I’ll admit I might have dismissed them even if I had. Over the years we’ve found that some people are a little harsh with their criticism giving low scores for things well outside of the campground’s control, like rainy days or cold nights. But this time I should have heeded their advice. Here’s how it went down. Once we exited I90 at Sprague we had to drive the RV (with the towed) across the freeway, through town, across the RR tracks and then under the freeway where we met a fork in the road. Both ways were dirt. Our Rand McNally RV specific GPS urged us to go straight…so we did. We traveled up and down a few rolling hay fields which were recently cut and baled. A few turns down some smaller unmarked dirt roads and we found ourselves actually driving though the fields on the roads the semi’s use to load said hay. Needless to say, we got a few strange looks as we barreled down these dusty temporary roadways looking for a way out. After about 15 minutes of traipsing around semi’s and hay bales we finally located the RV “Resort”, which was about a half mile from that fork in the road (if we had only turned left!!!). Once again we had to cross the railroad tracks as we entered the resort. The lake sure was pretty and the campground hosts/owners were super nice and accommodating. They weren’t booked so they let us have our pick of spots and everything seemed great. But Clark soon found out that the May Flies were making it impossible to fish…at least if he wanted to actually enjoy it. We also discovered the nearest town with a grocery store was Spokane, which we had already passed on our way here and would be a 40 minute drive (one way). But we desperately needed groceries and decided that we would have to go the following day. We settled in for the night. Living in an RV you eventually get used to certain sounds like rain on your roof (it’s louder than you think) or an occasional bird landing on your vent cover who then proceeds to chirp at you through the screen. You may even be able to sleep through a late night campfire drunkfest or early rising kids playing kickball against the side of your RV if you get stuck in the last spot available in all the land on Labor Day weekend. But trains are another story. I can handle trains from a distance…but 100 feet from my bedroom window can wake the dead. 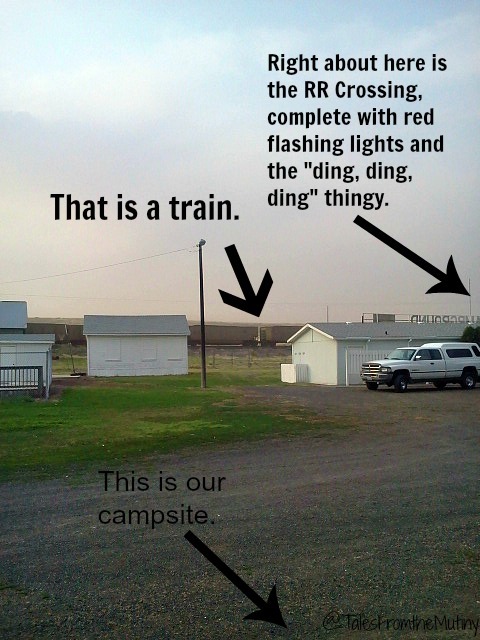 It didn’t even dawn on us that there would be a train coming through when we drove over the tracks to enter the RV park. Well, there wasn’t just one train. There were a dozen. And they never stopped coming until morning. To make matters worse, it appeared that since there was a road crossing the tracks (the road that led into the RV park and nowhere else) each of those trains were required to blow it’s horn as they approached the intersection which was equally required to flash it’s red lights and ring it’s bell. 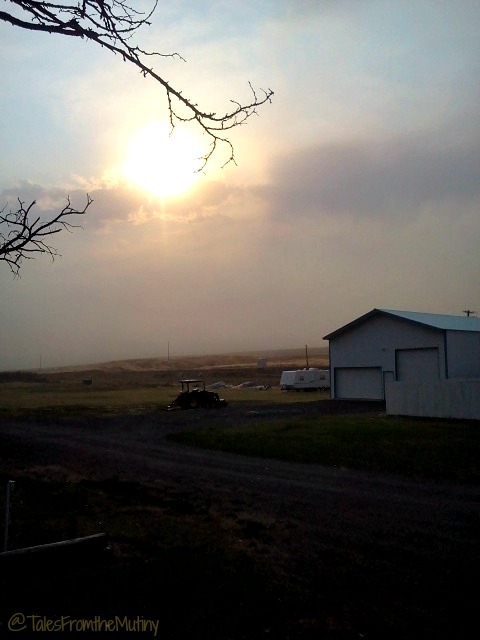 Haze and smoke coming our way…at least it looked cool! As if that wasn’t enough there was a wildfire (or grass fire, I’m not sure what was out there to burn except a million acres of dried hay) nearby which was exacerbated by some high winds accompanied by a thunderstorm warning which knocked several trees over…almost crushing a nearby travel trailer. These same winds sank a small boat at the dock. Trust me, it only sounds exciting. In reality it was exhausting and quite a disappointment at $33 per night. What made it worse was that the people who ran the place were so nice I felt bad even considering writing a negative review (much less a post about the whole thing). But hey, I kinda wished I knew these things before we decided to stay two nights…or even one, really. So I felt a moral obligation to share this with you. In retrospect it is a little funny. Especially driving through the hay fields like a couple of dummies (which was not the fault of the RV park really). But if you end up in the area you might want to push on a little further to find an RV park further away from the railroad tracks. Since writing about this experience is starting to bring me down I’ll end it here. It’s not always rainbows and butterflies but it still beats our life BRV (before RVing). I know we’ve all had bad experiences at RV parks since it’s often a crap shot picking one out. Feel free to leave your story (or link to your blog post) in the comments below. Sorry for the unpleasant adventure at a supposed resort. However after viewing their web site and the comments, it looks like you should of taken their reviews a little more seriously. Yes reviews are subjective, but should never be discounted. A lesson unhappily learned. To your readers, eastern Washington is a heavy agricultural area, where a lot of their water comes from irrigation systems. My father helped in some of its earlier design, 1950-52, but today it is much more efficient and modern. So it does offer a lot to our US economy, take away the May flies. Oh it was a lesson for sure. I probably failed to mention that this stop was back in early Aug 2014 so I think there were only 2 reviews at the time. And the owner of the RV park had not mentioned the May Flies on his website (which I don't hold against him…it's nature after all). It just took away one of the main draws for us stopping there (fishing). The other being locations (we don't do marathon driving but try to keep our travel days to 150 miles or so). But hey, it wouldn't be quite as fun if we didn't have the unpleasant adventures to remind us of how good we have it. We experienced the old bait and switch with the photos at a campground in Maine. It was very disappointing and we ended up leaving a day early because of it. It's made us very wary of booking at private campgrounds in advance! Sorry you had such a bad experience but hey, we got a geat story. Well written, you should write a book. Reviewing RV camping perhaps? This reminded me of our trip along the north shore of Lake Superior, in September of 2013. Good job I like your pics, do you have a photo of the dirt roads. Unfortunately, it's hard to get a complete picture of a place until you're there in person. And in our experience owners/managers don't often advertise things like how close the trains are or the highway. We rarely book ahead of time now. Oh my gosh! Not the Gloppida machine!! The might have lulled you to sleep after that experience!